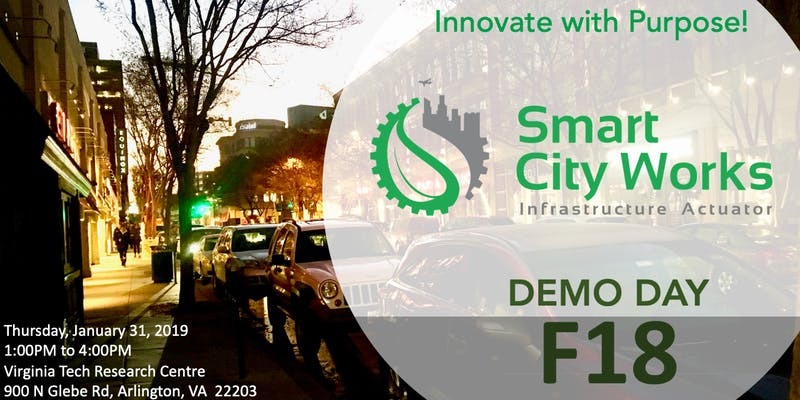 Washington, D.C., January 28, 2019 –Smart City Works, the world’s first business actuator and next generation business accelerator focused on infrastructure innovation and the built environment, today announced their first semi-annual Demo Day, which is being held Thursday, January 31, 2019 from 1:00 PM to 4:00 PM (EST) at the Virginia Tech Research Center,900 North Glebe Road, in Arlington, VA. This free event is open to the public and media. Physical and digital infrastructure start-ups were invited to apply last summer, with the focus of this latest cohort centered on bringing digital infrastructure to the physical world. The featured start-ups and technology firms provide solutions in Smart Construction, Supply-chain Management, Intelligent Buildings, Cyber Security, and GovTECH. Binni is a concrete management software company, whose platform makes it easier for frontline construction teams to organize, track and report on their entire pipeline of concrete pours. With binni teams can manage digital pour cards, batch tickets, field and lab QC tests, logistics information and more, in a single platform. Their solution delivers digital collaboration, real-time dashboards, streamlined reporting and advanced analytics. BuilDATAnalytics is a business intelligence company for the commercial construction industry. Their cloud-based, web-accessible software platform, CTBIM, is a tool that brings accountability through documentation from the field to management. CTBIM allows construction stakeholders from owners to architects, contractors and construction managers to have access, from any location in the world, to the same real-time information about inventory received, completed construction activities and contracting dollars earned through a web-accessible platform. BuilDATAnalytics empowers informed managers and executives to make smarter, faster and more impactful decisions through self-generated analytics from any location in the world. Polka Dot Sky Software puts the power local government in your hand by enabling local governments to rapidly improve citizen customer experience by delivering personalized, actionable information from multiple sources directly to smartphones. DC Public Works is currently using Polka Dot Sky Software’s SaaS solutions to deliver personalized residential service schedules and targeted scheduled and on-demand service reminders and alerts to its residents. They also use the software to send alerts to registered users containing actionable information about what to do next when their vehicle is towed or booted. SMART CITY WORKS is a new class of business accelerator, called a BUSINESS ACTUATOR, that can more rapidly move early stage ventures to commercialization, reduce risk for downstream investors, and improve likelihood of product uptake in the marketplace. Our mission is to accelerate innovation and speed commercialization of solutions that improve the livability, operations, and resilience of cities. We are uniquely focused on urban infrastructure, the built environment, and on changing the way we design, build, and operate civil infrastructure. Our Spring and Fall sessions are designed to propel graduating companies into the marketplace, endowed with proven products, and equipped with the skills to grow and compete for funding and market share. For more information about this event, visit www.smartcityworks.io. For more information, please contact Robert Mazer at 202-255-8505.